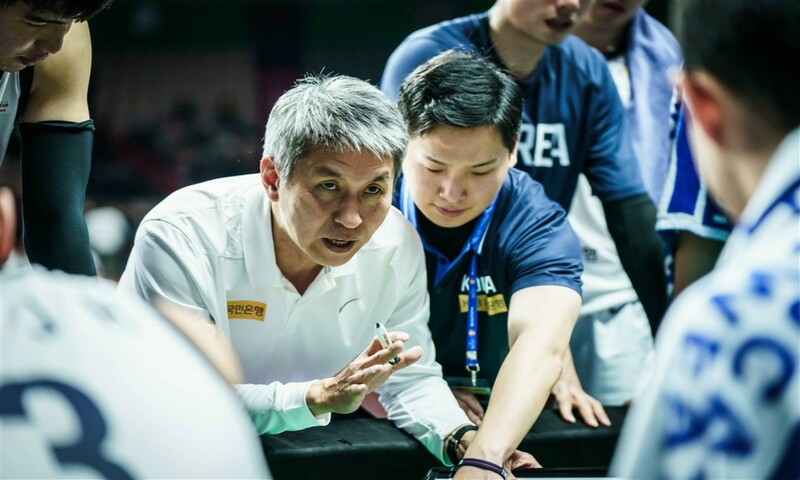 SEOUL (FIBA Basketball World Cup 2019) - Korea have two matches left in the Asian Qualifiers, and head coach Kim SangShik is looking at putting youth in the spotlight for that pair of fixtures. "I want to take a good look at the young players," he said after watching a Korea Basketball League (KBL) match between the Seoul SK Knights and Incheon ET Land Elephants. "I want to see which players have the skills we want and can play together with us in the World Cup." Korea have already qualified to the FIBA Basketball World Cup 2019, winning 8 of their 10 games so far in the Asian Qualifiers. Seeing as Korea are to face also-ran Syria and old rivals Lebanon on the road next month, Kim is planning to use the final window as a chance to test some of Korea's rising stars' collective mettle. "We will normally select players who have a had lot of experience in the Asian Qualifiers so far, but that does not mean we do not consider our young players," he said. "We have promising young players such as Yang HongSeok and Song KyoChang, whom we are considering for selection. If they show the ability, then they may get picked." Both Yang and Song have done well so far in the KBL, and that's why they've garnered Kim's attention. Yang plays for Busan KT Sonic Boom, averaging 13.0 points, 6.6 rebounds and 1.3 triples per game, while the 22-year-old Song sees action for Jeonju KCC Egis, putting up 13.6 points and 5.3 boards per contest. Those kinds of production have Kim thinking about opening up spots and minutes for the budding talents. "We sure have a lot of room for the two players," he said. "The thing is I feel I need to use a lot of players. It is not easy to just rely on a handful of players to play our trap and switch defense. It's exhausting for them, so I'm thinking of broadening our pool of players." Though Korea still have one final window to play, Kim is already thinking ahead and planning to use their matches against Syria and Lebanon to see which players he can bring to the World Cup to complement their main rotation. "We are of course looking for those who can do well alongside our best players," he explained. "I don't want to bring players just because they've played many games in the past. If some players - even the young ones - are able to impress in the last window, we can give them strong consideration for the World Cup in August." The 51-year-old head coach is aware of the significantly increased level of competition at the World Cup, and he will keep that in mind when they begin their preparations in ernest. "The competition level of our opponents at the World Cup will be much higher," he said. "Our team will need those with size, strength and speed to compete. It will not be an easy decision to choose, but I am confident we have very good players." Korea face Syria on 22 February and finish their Asian Qualifiers campaign against Lebanon on 24 February. Both fixtures will be held at the Nouhad Nawfal Sports Complex.